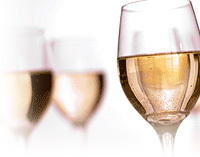 A close relative to Pinot Gris, Pinot Blanc is similar to its cousin in both flavor profile and where it is produced but is generally considered secondary in importance and popularity. Relatively mild in flavor, it is considered a good apértif wine—light, neutral, and versatile. The flavors of Pinot Blanc tend to fall between those of Pinot Gris and Chardonnay, two popular varietals to whom it is related. Although not as intense aromatically as Pinot Gris, it typically offers green apple, melon, and pear fruit flavors, stony mineral notes, and hints of baking spice and almonds. While rarely sweet, it can take on a honeyed flavor profile and texture despite its bright acidity. It is generally not oaked. Antipasti, shrimp, bean salad, light fish dishes. Onion tart, pork sausages and sauerkraut, well sauced chicken. Salmon, scallops, light chicken and pork dishes.